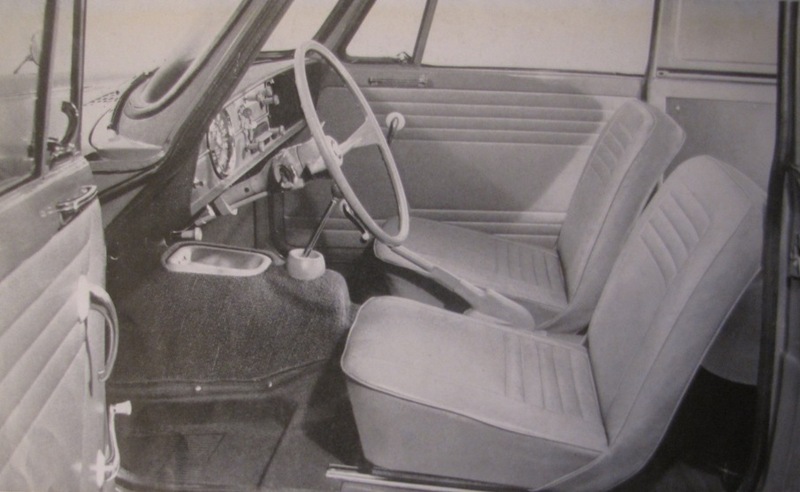 In 1960s Israel, the compact mini-van was a station wagon, with lots of space for cargo and potentially also a kid or two behind the rear bench. Those lucky enough rode a five-door “station”, a Ford or maybe an Opel, while others had to make do with a three door variant. 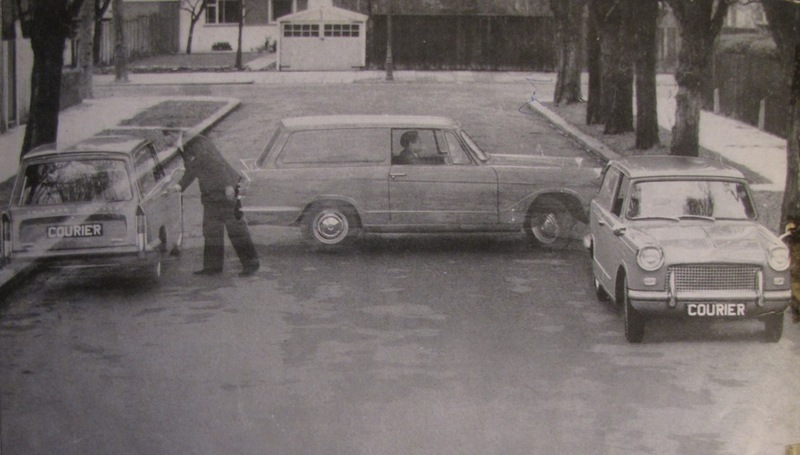 One step down were the light panel vans, actually the very same three door wagons, with metal panels replacing the rear side windows, and with two front seats only. That was a tax shelter. With these panel vans being classified as a commercial vehicle, they could enjoy reduced taxation, which at times meant a 15% price difference to a proper wagon, and made the purchase of a grey or white panel van a very sensible solution for your family. And as Israelis have always been creative, it did not take long before two small glass windows were fixed into the rear sides of the van, a rear bench was bolted into the floor, and all lived happily ever after. The above formula was no secret, and the management of the Standard-Triumph importer since 1934, Israel Motors of Haifa, was well aware of it. 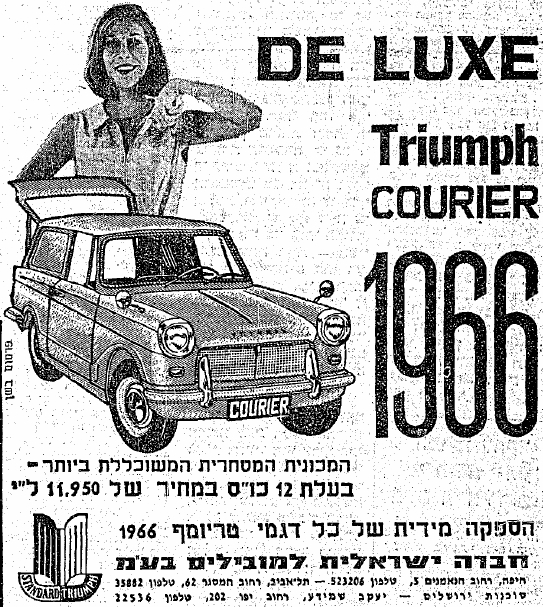 As of 1961, the sporty Herald was the backbone of Triumph sales in Israel, with substantial success. 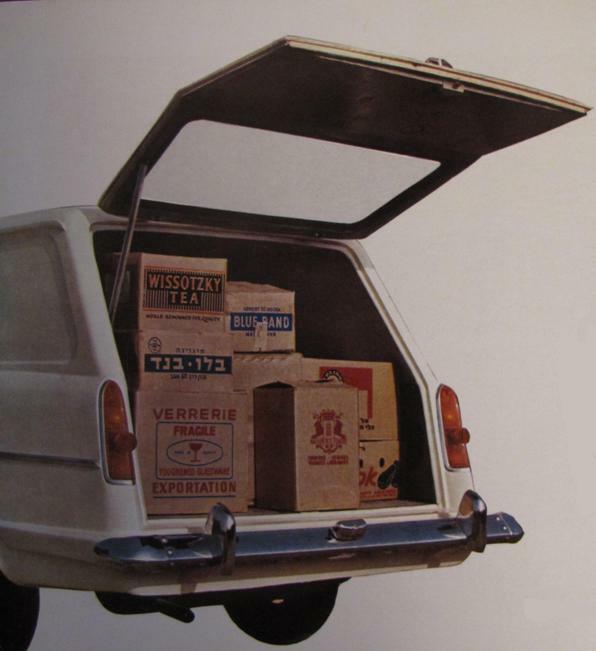 When a panel van, named “Courier”, was launched in the UK in February 1962, it was soon exported to Israel. The first Courier was registered in Haifa in July 1962. Panel vans were very popular in Israel, but less so in Europe. 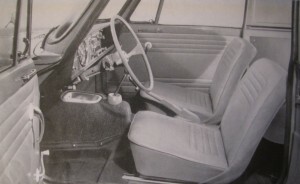 Other than tax sheltered markets, such as Denmark and the Netherlands, and the panel van-sympathetic UK, the Europeans were apparently not open enough to prefer this over a genuine wagon – with side windows and a rear bench. And as this was a rather compact, but not that inexpensive van, the demand for the Courier was low. Two years and a half and some 5.000 units after production started, Courier assembly in Canley ended. 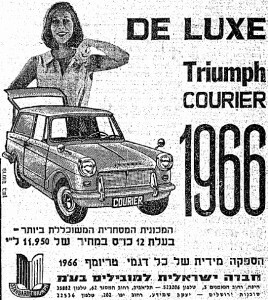 As expected, the Israeli distributor did not particularly appreciate this change in Triumph’s line-up, as the Courier imports, 33 vans in total, constituted over10% of its total imports during 1964. At the time, Standard Triumph operated a global network of twelve assembly plants, spanning from Belgium to India and New Zealand. The concept was simple: CKD sets were imported, taxation was lowered. 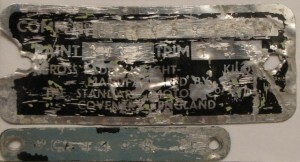 In some cases assembly included models that were tailored for the market or, better yet, obsolete models that were no longer being sold in the UK. In Malta, a local assembler named Mizzi Car Assembly (MCA for short) launched in1960 a Herald assembly line in the city of Marsa. MCA continued to assemble the Courier after its British demise. Period documents raise the question whether the Courier assembly was destined for Israel only, but in any case, over the months of October and November 1965, a total of 54 units were assembled by MCA and shipped to Haifa. Priced at IL 11,950, it was an expensive van, but these vehicles were all sold by end of next March, a testimony to their solid sales potential. On Friday, 3 December 1965, Standard-Triumph signed a contract with Autocars Co. of Tirat Carmel, a local manufacturer of the glassfibre–bodied Sussita and Carmel. Autocars was to become an assembler for Triumph in what was seen as an emerging market. 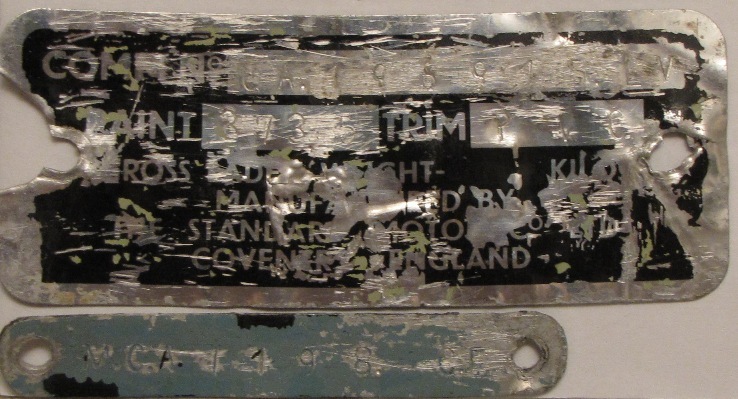 A week later, a termination letter was mailed to the long-established local Triumph distributor, fixing the termination date at 15 February 1966. Over the coming two months, the Leyland management discussed the future distribution of Triumph products in the Holy Land. “By giving to Autocars exclusive distribution rights there will be a breach of the Agreement with Israel Motors”, wrote Leyland’s secretary and solicitor, A.J. Everton, to George Turnbull, the Leyland General Manager, adding that “it should be pointed out to them [to Israel Motors] that Autocars have agreed to appoint them main Distributors for imported built up Triumph vehicles…in addition they are being offered the Autocars franchise which they did not have previously”. It is at this point that the secretary approaches the Courier issue. “They therefore cannot be said to have suffered any material loss, although in this connection I think the question of the imports of the Courier from Malta…should be considered”. The “Courier question” was all too clear after a quick look at the Autocars line-up. While Triumph was generally offering cars that appealed to a different audience than that of Autocars, the Courier was a potential strong competitor to the Sussita 12 Van, a major product whose assembly started in those very same months. Autocars, surely enough, would not present an imported van, with a much better image, next to their Sussita, even if price difference was a hefty one at 27%. Everton got the picture right. 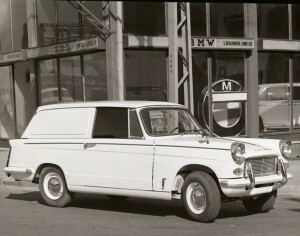 On 1 February 1966 Zvi Sperling, the Israel Motors owner, gave his written agreement to the contract termination, in return for his appointment as the local distributor of Autocars and of the imported Triumph products. In the Tel Aviv showroom, the elegant Courier gave way to the Sussita 12.